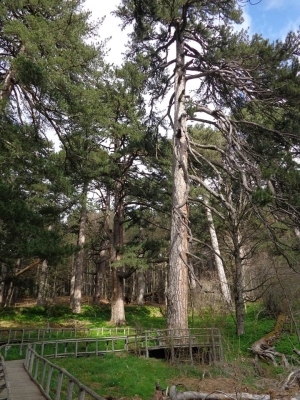 Parco Nazionale della Sila - Sila, gran bosco d'Italia is part of the Tentative list of Italy in order to qualify for inclusion in the World Heritage List. We went through the Sila national park in April 2017. We first drove the north part from Rossano to Camigliatello Silano: small roads in the mountains, slow drive, and no traffic at all. On the way we made a stop at Visitors Center in Cupone, which is on the shore of Cecita Lake. There a few rangers were attending school groups with their teachers, but because we were off season, no information was available for individual visitors. We stayed for the night in Camigliatello Silano. The place may be busy in winter (for ski) or during summer, but was extremely quiet in April: we could not find a restaurant open. The night was very cold and almost freezing because of the altitude (ca 1000 m asl). The next morning we had organized an appointment at “Giganti della Sila”, or so “the Giants of the Sila”, a nature reserve where old (more than 100 years old) laricio pine trees can be seen. This reserve is located in Falistro, a small village close to Camigliatello. The place is well sign-post. It is open daily during summer months, but closed in April, so we had to book our visit in advance, contacting FAI Sila via e-mail (Fondo Ambiente Italiano). It worked very well: two rangers were waiting for the 4 of us on due date and time, one of them gave us some information about the site (and posters and leaflets to the children, who enjoyed them) before letting us walk the different paths of the reserve. These pines are specific of this area and mentioned several times as a reason for inscription. This was our best experience in Sila national park. Worth noticing, we only paid the normal entrance price (2 euros per adults, free for children, means 4 euros for the 4 of us), no extra cost for opening the place just for us. The reserve is fenced and closed, so you need someone to be there and open it for you. Such a highland with cold weather is not what someone would expect when visiting Southern Italy, however this is not really outstanding for me, in the sense that such landscapes with similar flora and fauna can be found elsewhere in Europe. But thanks to the nice rangers who welcomed us at the Giganti della Sila reserve, we enjoyed our visit there and would recommend it to anyone travelling in that area.